Born in Hebron, Graskop in Mpumalanga, South Africa, Africa Tsoai is a South African actor and voice over artist popularly known for his acting role as John Maputla the husband of Meikie Maputla (Harriet Manamela) and father of Leeto (Eric Macheru) and Thabo Maputla (Thabo Mamabolo)in the soap, Skeem Saam. 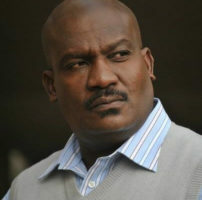 He was born on the 4th of July 1967 in Hebron-Graskop in Mpumalanga, South Afric. As of 2018, he is 51 years old. Yes, of course, he is married. However, information about his wife is unavailable. All we know for now is that Africa Tsoai has four children. Africa Tosai is an actor, a voice-over artist, a producer, a businessman, a sound engineer, and translator. He attended Rudolph College in Johannesburg, where he studied graphic design. A self-taught fine arts enthusiast who got his diploma in 1989 and later did a sound engineering course at In-house Records, Randburg in 2000. In 1996, Tsoai started his own small business.